An extraordinary night of music was enjoyed by a packed Town Hall Theatre on Saturday evening. Music for Galway, that simple title that conveys so much, celebrate 30 years of existence during which it placed Galway high on the map of venues for many of Europe’s leading musicians, performers and choirs. It has initiated not only a loyal following for its exemplary Autumn and Winter programmes throughout the years, but enabled the talented Con Tempo Quartet to reside here as its ensemble in residence. This popular quartet has now merged into a music residency which delivers performances, education and community programmes to schools, and groups throughout the city and county. Music for Galway is one of the great cultural attractions of our city, which gives us the edge over all other centres, and a quality of life envied by many. It all began in 1981 when a group of enthusiasts got together at Erica and Tim Casey’s home frustrated by the lack of facilities, venues, and instruments to attract the very best in the classical music world. That group quickly grew in numbers, and with modest funds set forth to realise its ambitions. It has been remarkably successful. The first objective was to buy a Steinway grand piano. The university immediately stepped forward and offered the top floor of the newly refurbished Aula maxima as the Steinway’s permanent home; and the perfect venue for performances. Through the years, under the leadership of dedicated people, including the renowned composer Dr Jane O’Leary, Galway has hosted some of the best talents on the world including Yehudi Menuhin, Nigel Kennedy, Wolfgang Holzmain, Stephen Bishop Kovacevich, Evelyn Glennie, Ann Murray, Joshua Rifkin, and famous ensembles such as the Takacs Quartet, and the London Mozart Players. Saturday was a fund-raising night but patrons had outstanding value for inexpensive tickets. Two charming Russian singers - the soprano Evelina Dobraceva, and baritone Rodion Pogossov, won a standing ovation not only for their individual and duet performances, but for their ability to act, enchant, and amuse as well as admiration for their comic performances. Their ‘pa-pa-pa duet from Mozart’s The Magic Flute was a delight, exquisitely performed, their beautiful voices blending perfectly. They were accompanied by Dearbhla Collins, and presented by Sean Rocks of RTE, who introduced the different arias with swish and humour. It was also an evening for acknowledging those who had helped Music For Galway to achieve its goals, and maintain its high standards. Jim Browne, president of NUIG, accepted an award on behalf of the university’s commitment and accommodation to Music For Galway; while Erica Casey received an award for her initial organisation and energy which saw the association grow into the formidable group that it has become, delivering to Galway the very best of the music world. Chairman for the evening, and long-time supporter, Seán Stewart, said the success of Music for Galway was due to the astonishing width and breadth of the love, effort and passion put into it by its founders and those maintaining and developing it over the last 30 years. Further money was raised thanks to the generosity of sculptor John Behan RHA (who presented a bronze musician for the auction ), and Phyllis McNamara of Cobwebs, who presented a double strand of freshwater pearl necklace, also for the auction. These items were quickly sold with humour and expertise by James Heaslip. 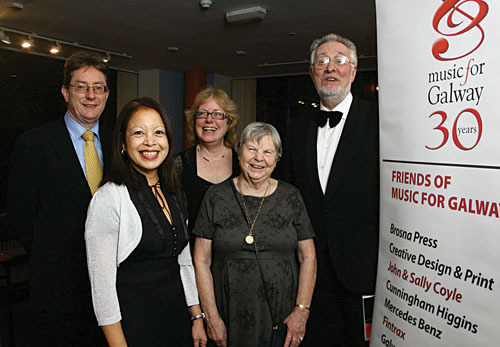 An essential part of Music For Galway’s success was the dedicated leadership of its board of directors, led in recent years by Delia Breathnach, and its executive officer Anna Lardi Fogarty. The board organises the annual programme, booking artists sometimes years ahead due to their busy schedules. Judging by the ease with which they presented Saturday’s concert no-one could be surprised that Music For Galway achieves such high standards, and never fail to attract stellar performances. Already an extensive programme is planned for its gala year including the RTE National Symphony Orchestra, the Danish String Quartet, the Vanbrugh Quartet, and on November 30, Jue Wang, the Gold Medal winner at this year’s Santander International Piano Competition.